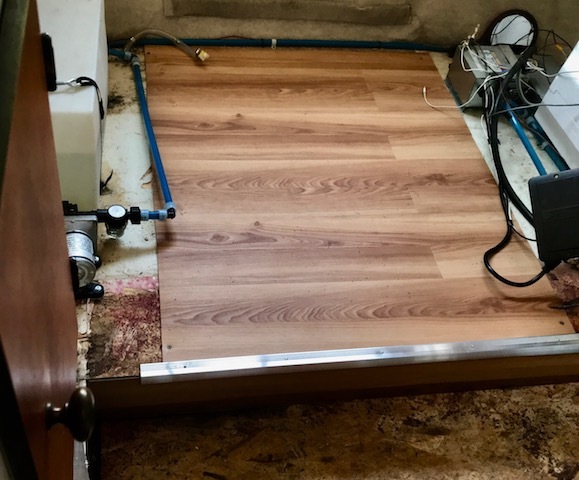 Scamp Trailer installed this panel in the side of one of the bench seats. Very unfortunately, this panel was installed with electric wires that are sooooo short, that it is almost impossible to service the panel. The reason for this is, because of those extremely short wires, when the securing screws are removed, the panel cannot move away from the wall. 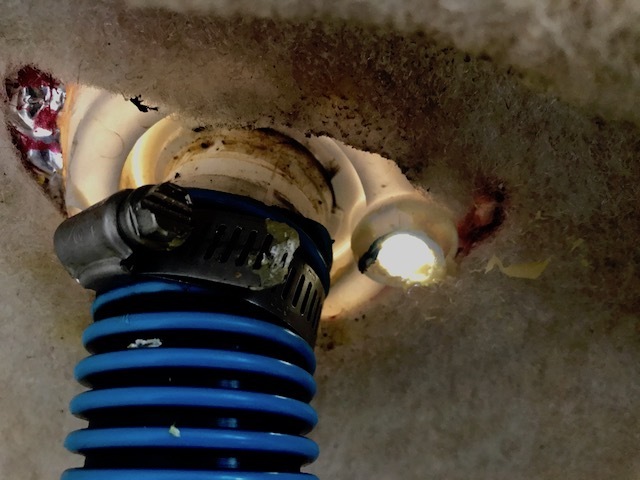 This is one of those mistakes that Scamp Trailer makes every time they make an electric installation. It's like they just plain cannot figure this thing out! Weird! I am going to lengthen each wire going to the electric panel so that I will be able to re-install the panel in the bench seat easily. The way it is now, the panel must be forcefully driven thru the opening in the bench seat! Ridiculous! Example of Scamp Trailer lack of workmanship. Three black wires going to ground terminal strip! Yesterday when I checked in to Motel 6, the thing that I wanted more than anything was a Hot Bath! But the tub only had warm water! I asked about that at the office, and the lady came over and checked the water. "That as hot as it gets", she informed. This morning when I woke up, I checked the water again. It was hot! Yippeee! Filling the tub with precious hot water, I soaked for over 1/2 hour. Because there was much more unanticipated prep work that remained to be done, we did not get started on laying the Vinyl Planks until after 1pm. So, we have booked another nite at Motel 6. Same place as yesterday and the only hotel in town that will book Baby Boid! 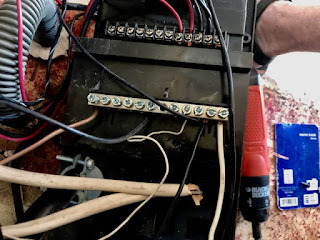 Yesterday when I had to forcefully shove the 12-volt/120-volt electric panel thru the hole in the bench seat [See the 2:58 am Blog post above], I must have broken a circuit. Now there is no power to our 120-volt inverter. This electric problem must be fixed. But not until after the vinyl plank flooring is laid. This is the Vinyl Floor at 3:40pm. Take a look the pics below. Res Ipsa Loquitur! Closeup showing the broken vent fitting. If you Cap the vent off you create a vacuum. Your vinyl plank flooring stay away from the peel and stick. the sticky doesn't stick. Overtime it floats free The glue down is about the same. No way that a vacuum may be formed because the needless vent tube is sealed off. The tank is connected to the atmosphere thru the filler tube. Ed, did you proof-read your last paragraph? I've commented to you about proof-reading before. Words are important, Ed. When you fail to use the words necessary for comprehension, your readers do NOT get comprehension! PS: I intend to fill the tank with the vent sealed in order to view the result. it is suggested to stay away from the peel and stick kind . customers have been complaining read the reviews. They complain. that overtime it does not bond well. If you personally glue it down, I would not suggest you do that. It will hamper you for any future repairs. The snap together kind are basically the best, just use a vapor barrier pad. Snap together kind will not hamper you in any future repairs. Now let me asked this question? On your water fill system on the outside of the trailer, is it a flip up cap that you lift up And you pour water in ? Scampi trailers use all three types,, what type do you have ? The cap on Scampy's fresh water filler tube is a screw-on cap. This cap is not tight fitting. The hose just fits inside the filler tube when filling the fresh water tank. Ed, I want you to know that because of your urging, I have decided to repair the fresh water tank's vent tube. The reason that I am doing this repair instead of abandoning the vent tube altogether is because of your staying on my back on this issue. Is the vapor from Liquid Nails harmful to Boid? Maybe you could keep your motel room for a few days for a safer, less chaotic place to stay during your renovations. I like the flooring. Yes, that vapor would be harmful if Boid were exposed to it. But he is not exposed to it in concentrations that come even remotely close to that. Thank you for liking the new flooring! I have to agree with Ed, if you plug the vent the tank will not fill. If you have a pair of vice grip pliers pinch the vent hose shut before you go to the work of unhooking it. Your flooring looks like a great project, you will really enjoy it. The fitting for the vent is busted [cracked]. That is the reason water leaked on Scampy's floor! I intend to figure out a way to re-hook up the vent tube to the the busted fitting. Should't be too hard to do. I had very hard time getting water right fit on fill hose. Tried different stuff. Finally put on shut off valve at tank. You also need vent to displace vent when filling. Shut off valve from swimming pool/spa supply place. Dont like having to lift kitchen seat everytime I fill, but no more leaks with filler hose with hose clamp and fill hose with stiff wire built into it. Regular cheap vinyl hose... people said bad for drinking out of vinyl? I now agree that a vent tube is required on Scampy's fresh water tank. 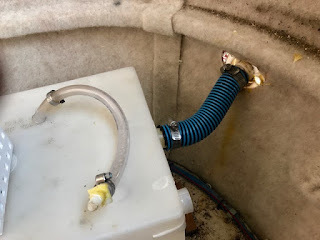 Our leak came from a badly connected vent on Scampy's fresh water tank. I am taking care of the vent this morning!